There is currently a bug in Windows 8.1 that causes any label with a barcode to print abnormally in DLS. We are awaiting a fix from Microsoft, but in the meantime, you will need to modify a setting in DLS to workaround the issue. To do this, go to Edit -> Preferences. Navigate to the LabelWriter printer tab and change the “Print Quality” to “Text”. There is one side effect to making this change and that is your labels will always print at a resolution of 300×300 DPI. For barcodes, we typically like to switch our printers into high resolution mode (300×600 DPI) in order to improve barcode scanning reliability. When the “Print Quality” setting is set to “Auto” or “Barcodes and graphics”, the resolution will always be 300×600 if a barcode is present on your label. That being said, for most barcodes, 300×300 DPI is plenty of resolution. You may encounter scanning issues for barcodes with lots of data or 2D barcodes, though. We apologize for this inconvenience and will keep everyone updated on a fix for this issue. Microsoft has released a fix for this issue. It can be downloaded from the below links. Thanks Bjorn for the heads up! What kind of “abnormal” are people experiencing? The abnormalities are just as you described. The label will print very small and in the top left corner of the printable area. I can find nothing about print-quality or changing the resolution. Is this only a setting on the client-software or can this option be embedded in the label xml definition? This is a setting found in the printer driver settings. If printing from DLS, the setting can also be modified there. This solved my issue. Thanks so much!!! Has the bug with Windows 8.1 been resolved yet? The only drivers available for the DYMO 450 are pre Windows 8. Yes, the bug (KB2911106) has been fixed by Microsoft! DLS 8.5.1 (http://download.dymo.com/dymo/Software/Win/DLS8Setup.8.5.1.exe) is supporting Windows 8 and 8.1. Have you ever noticed any odd behaviour with the SetGraphicsAndBarcodePrintMode function via .NET? It seems that when I set this to true I get everything printing in text mode (fast and low quality). When I set it to false, it will sometimes print in graphics/barcode mode. However, I also find that it seems to be ignored by DymoAddIn, and that the only way to force the printer to print in barcode mode programmatically is via the Windows printer settings. Does this sound at all familiar? I’m accessing through LabVIEW, but it’s the same Interop.Dymo.dll as used in your C# / ASP examples elsewhere. I am not aware of the behavior you mention for graphics and barcode printing. I would not be surprised if the addins ignore this setting, but I would have to double check. As for app that uses our SDK, barcode and graphics mode should without problems. Could you post a sample from your code showing when you call SetGraphicsAndBarcodePrintMode() and when you call print()? I have developed an application in C# .NET and I have the problem that when I assign an image over the AddImage() method of ILabelRecordBuilder so the image is not printed. In Windows 7, there are no problems, this problem only occurs on Windows 8. I have developed a small console application. If you leave out the AddImage() method, then it works without problems. Hi, I have sent an email to above email address with sample app. I tested on both platform win 7 and win 8 and it works just fine. I have sent sample app to your above specified email address. pls provide your email address to send zip file. Above email address is not working, giving me failure delivery of email. I hope you can help me out with a weird issue I am having on Windows 8.1 pro.I have a C# program that uses the DYMO.Label.Framework to print a dymo label that has a barcode Code39 object. The barcode is big enough to hold the data it prints and it has never being an issue up to now. The barcode is centered aligned and when it prints, it only prints half of the barcode. I tried left alignment but still does not print the last 2 lines of barcode. I have already tried all the suggestions from here but it still does not work. I also ran the SDK Dymo Label Framework samples and it also fails to print the whole barcode. If I use the Dymo software itself(DLS) to print it, then it works as it should. Any help it would greatly appreciated. Make sure that KB2911106 has been installed. Furthermore verify that your label template prints correctly from DLS. Please also provide your label template file (.label). I installed KB29111106 with no luck. Also, when printing from DLS works fine. Not with sample program or my program. I will send email with label. This issue is being caused by a bug in .NET 4.5. Fortunately the bug has been fixed with .NET 4.6. I have this barcode problem with Windows 10. My .NET application using the DYMO.Label.Framework.dll only prints half barcodes. The label template file prints fine from the Dymo software running on that computer. .NET 4.6 is already included with Windows 10. It will not let me install KB2911106 onto Windows 10. Can you set target framework to 3.5 in your project property? It looks like that our barcode has been rendering correctly before framework after 4.0. We submitted the ticket to Microsoft, and we are working on solution as well. I have problem with Windows 10 too. I use DYMO.Label.Framework.dll in my C# app. Label from template file prints ok from Dymo soft, but in my app printer print only blank label. I use Code128 Auto. I set target framework to 4.0 , 4.5 , 4.6 – nothing. In Windows 7 or Windows 8.1 systems my app works fine. – Is the issue only with barcodes? If you add other label objects to your label do those print blank as well? – If the issue is only with barcodes, if you move the barcode to the far left side of the label does it still print blank? We have seen issues in the past where objects towards the end of the label print blank. I am also having the same half printed barcode issue with Windows 10. 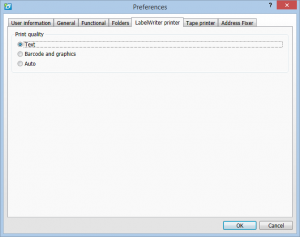 Label prints fine in Windows 7, 8.1 and in the label software. The app targets .NET 4. Everything else on the label prints fine except for the barcode, which only prints about 1/2. There is a bug in the .NET Framework that effects the way Microsoft handles printers with “non-square” resolutions (ex.600×300). When barcodes are present on a label, we print at this higher resolution instead of the normal 300×300 to help with barcode quality/scanning. We had logged an issue with Microsoft and they claim to have fixed the problem in .NET 4.6, although our preliminary testing does not seem to indicate so. We are continuing to look into this issue and trying to find workarounds. Users have successfully printed barcodes when they have changed their targeted framework to 3.5. Thanks for the response. Since you mentioned the resolution, I read somewhere else to try printing the barcode as text. I see that another benefit from doing that is the faster print speeds. I was able to do this in DLS by going to preferences and updating the print quality, but how do I change the specify the print quality (text vs auto) when printing from the SDK framework? You can use the LabelWriterPrintParams class to set the graphics mode that adjusts the printed resolution. Has this DYMO bar-code printing bug been fixed yet? We are using Windows 8.1 Pro 64 bit with a C# WPF application running .Net 4.5.2 64 bit and are unable to print a complete bar-code using the DYMO SDK for .Net. I’m running into the same symptoms as everyone above. I’ve got a .Net 4.6 WPF app which for many reasons, I cannot roll back to 3.5. I am getting a partial barcode printed, it looks like about half (centralised alignment, Medium Size). If I left align it and set the size to small, then more of the barcode gets printed but not everything. I tried all 3 resolutions, Text, Graphics and Auto from within the App using LabelWriterPrintParams and all have the same result. Only the speed of the print changes. I am using Code 128 Auto as the barcode format but experience the issue when using other formats too. I’m trying my best to retain the Dymo printers as we have quite a few of them. I’d be very grateful if someone can shed some light on the current fix for this issue. I’ve looked at all the other framework options (there are very few), so cannot see a possible solution. It works fine from inside the DLS. Prints fine no matter what the print options (Text, Graphics, Auto – set via Preferences). I’ve also tried various combinations of settings from the Print Defaults on the windows side. They seem to have little of not No effect. This is a bug in the .NET Framework that effects the way Microsoft handles printers with “non-square” resolutions (ex.600×300). When barcodes are present on a label, we print at this higher resolution instead of the normal 300×300 to help with barcode quality/scanning. We had logged an issue with Microsoft. If you can’t roll back to .NET 3.5. then you can try printing your labels in portrait orientation. We have had success with this method in the past. We are looking into this issue and working on a workaround. We will update this blog post as soon as we have more information. Any update to this windows 10 – half barcode bug? Windows 10 is getting more and more popular so hoping there is a resolution to this soon! I am running a fully updated version of Windows 10 and printing labels from ACT 18 pro, using DymoActAddin version 8.5.3. The barcode truncates after the 19th bar. If I copy the same address into the Dymo application directly there is no problem and the bar code prints correctly. I suspect that ACT 18 is compiled against a newer version of .NET and that is why you are experiencing problems. We are currently working on a fix for this and will update this blog when the fix is available.